Toluca Lake is a district, 12 miles north of downtown Los Angeles, in the San Fernando Valley region of the city of Los Angeles, California, and a “community within two communities, North Hollywood and Burbank”. The name Toluca means “fertile valley.” Toluca Lake started out as Forman Toluca Ranch, a ranch known for its crops of peaches, apples and walnuts, but after development is currently home to affluent residents, many of whom work as part of nearby Hollywood’s film industry. 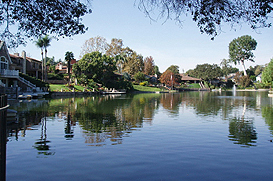 Movie stars and singers such as Frank Sinatra, Bob Hope, and Bing Crosby have previously called Toluca Lake home. The city was also home to the first International House of Pancakes (IHOP).